We love potatoes. We love pesto. But too much of either adds up to a lot of calories. No worries, though. 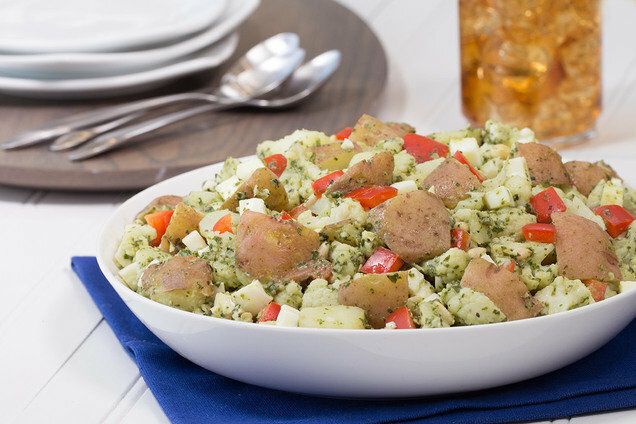 To make this tasty potato salad, we added cauliflower and egg whites to pump up the portion size. Then we used Greek yogurt and kale to make a perfect pesto that's low in calories. Serve it up! Place potatoes and cauliflower in a large microwave-safe bowl. Add 1/3 cup water, cover, and microwave for 6 minutes. Stir, re-cover, and microwave for 3 minutes, or until tender. Once cool enough to handle, drain excess water. Meanwhile, in a blender or food processor, combine basil, kale, yogurt, Parm, olive oil, garlic, salt, and black pepper. Add 2 tbsp. water, and blend/process until a smooth paste forms. Add basil mixture to the large bowl, and stir to coat. Add egg whites, bell pepper, and pine nuts. Mix well. *Prep/Cook FYI: Times do not include hard-boiling, peeling, chilling, and chopping the egg whites. If not done in advance, allow about 5 minutes for prepping, 20 minutes for cooking, and 1 hour for chilling. Hungry for More Cookout-Ready Side Dishes? Click "Send to a Friend" to ensure a batch of this salad makes it to your Memorial Day party!